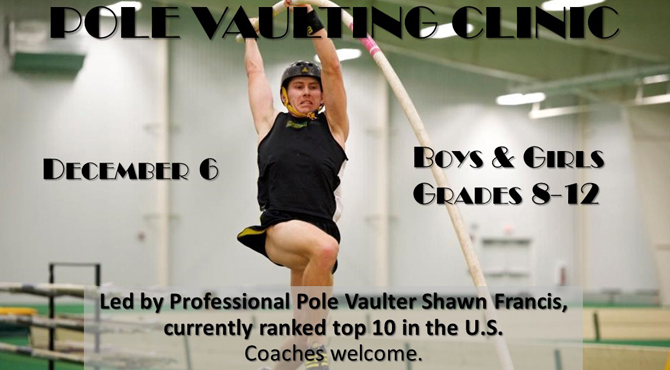 Boys and girls in grades 8-12 are invited to attend a pole vault clinic led by pro vaulter Shawn Francis, currently ranked #10 in the US. 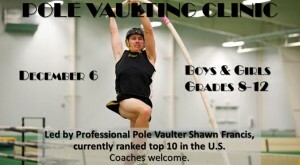 The clinic will be held Saturday, December 6 from 1 to 6 pm in the SDC Multi Purpose Room. Skills covered will include: approach and plant; take off, inversion and pike; and drills to improve individual parts of the jump. Coaches are welcome. Cost to attend is $99/participant and $25/coach. Space is limited, and pre-registration is required by December 4. School’s Out, the SDC’s In… Thanksgiving Break Edition!!! 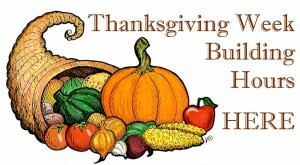 Spend your Thanksgiving break at the SDC! Friday, November 28th through Sunday, November 30th, the SDC may have limited hours, but there are tons of indoor recreation options for family and friends to enjoy! SDC day passes are available for $6…. group rates as low as $4 per person! Take the whole family or a group of friends skating! Check out Drop-In Hockey Friday, November 28! And let’s not forget… the trails are open! With so many great options, there’s something for everyone! For everything Michigan Tech Recreation, visit michigantechrecreation.com. Looking for some extra ice time over Thanksgiving? 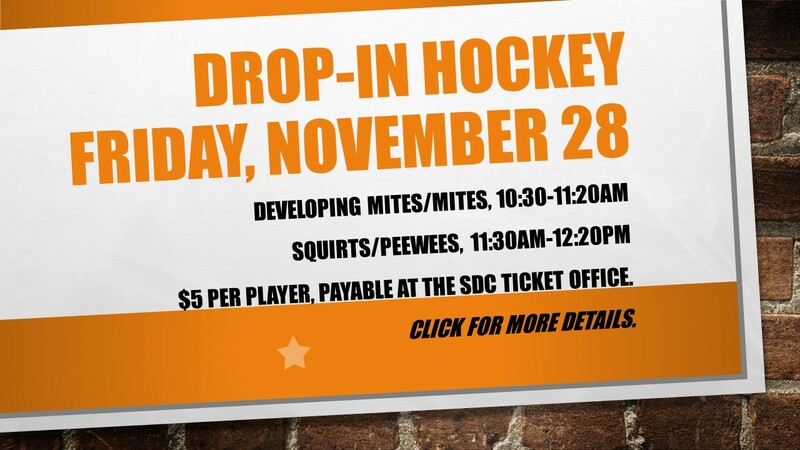 Check out Drop-In Hockey Friday, November 28 at the SDC! 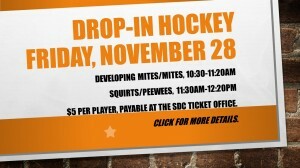 Developing Mites/Mites – 10:30-11:20 a.m.
Squirts/PeeWees – 11:30 a.m.-12:20 p.m.
Full equipment is required. Cost is only $5 per player payable at the SDC Ticket Office. Open Skating at the MacInnes Thanksgiving Break! Open skating is available over the Thanksgiving holiday break Friday, November 28, from 12:30-2:30 p.m. and Sunday, November 30, 7:30-8:50 p.m..
$2 per person payable at the SDC Ticket Office. Where else can you give thanks AND work off that extra piece of pumpkin pie? The SDC of course! Although hours will be limited, there’s still plenty of time to go for a swim, play some hoops in the multi or try out some of the new equipment in the Fitness Center. 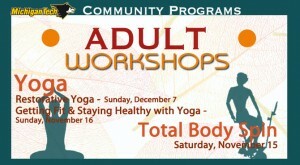 More Fall Adult Workshops on the Horizon! Winter may be here, but we’re not ready to give up on fall! Our fall Workshop Schedule is filled with individual classes that will help you break down the basics, get comfortable and challenge yourself to go deeper into your favorite programs! Try out one of the upcoming yoga or total body spin workshops! School’s Out, the SDC’s In! ​Friday, November 7 is a day off for most local schools. Spend yours at the SDC with a special School’s Out Day Pass! $8/day, your SDC”School’s Out” all inclusive Day pass includes access to the pool, multipurpose room AND ice rink! (Children 11 & under require adult supervision. Fitness Center available to students 16 & older only. Multipurpose Room (basketball, volleyball, & more*): 8:00 a.m.-3:00 p.m.
Open Swim: 10:00-11:30 a.m. & 1:30-4:30 p.m.
November 7th School’s Out participants can receive a $10 combo ticket to the Michigan Tech vs. Northland 5 p.m. volleyball game and the Michigan Tech vs. Alaska Anchorage 7:30 p.m. hockey game that evening! *Sports equipment rental rates vary. Basketballs and volleyballs are free of charge. Passes may be purchased at the SDC Ticket Office. SDC Youth Members only pay $2 (to cover Open Skate). Valid only on Friday, October 10 and November 7, 2014. For more information, visit www.MichiganTechRecreation.com or call Recreation at 906-487-2975.